Bioroids and Bombots: Weapons: AKVs and Effectors. In the last couple of blogs I have considered some of the weapons available to spacecraft in TS. I have even suggested some new systems. All of these weapons have been relatively short-ranged. One of the features of space warfare will be that the enemy will often be visible at very great ranges. An modern astronomical infra-red sensitive telescope can see a heat source equivalent to the space shuttle’s main engines out at the orbit of Pluto (about 40 AU). We can assume a future space warship will carry telescopes at least equal to the best used by modern astronomers. Such instruments will cover a large slice of the electromagnetic spectrum including visible, infra-red and ultraviolet light as well as radio, gamma and X-rays. A spaceship using its engines will be visible to anywhere in the solar system where there is a clear line of sight. How far away will a ship be visible if it is coasting? My sources differ on this but this estimate suggests 4% of an AU, or about 20 light-seconds. If the spaceship is moving at 1% of light speed it will take just over half an hour to travel this distance. At 11km/s it will take over 6 days. In other words, an enemy has plenty of time to prepare for an approaching ship. Detection range of a coasting spaceship may be even greater than the 20 light-seconds one source suggests. If, by some wondrous means, your ship was totally non-reflective it is still likely to appear as a darkspot at some wavelength range as it passes before stars and other objects. The same problem occurs if you could somehow cool one face of your ship to ambient temperature. Stealth requires something to hide in or behind. In the vacuum of space there is nothing, so there is no stealth in space. While space is very big, it is also very empty and cold, making a ship or any other object visible if you look for it in the right place. Any spacecraft is going to appear warmer than its background. Even if a ship was perfectly insulated it would have the problem of finding a way to shed the heat its systems and crew will naturally produce. An engine flare observed 40 AU away is actually an event that happened more than five hours ago. This is the time it will take visible light, infra-red or other electromagnetic radiation to travel this distance. There may be considerable difference between where a ship actually is now and where it was observed. The vast volume of space will probably mean that active sensor systems such as radar will only be useful if you already have a pretty good idea where the enemy is. Transmitting radar pulses over a wide area will be a pretty good way to let the enemy know where you are so the active systems used will probably be highly directional tight-beam radar, lidar or maser systems. There may be no true stealth in space, but drawing attention to yourself and telling the enemy exactly where you are is still not prudent. It is likely a warship will deploy a sensor drone for any active detection duties. Passive systems such as multispectral high-power telescopes and detectors will probably the primary means of initially locating the enemy. Computers will process images and look for objects with unnatural behaviour. While full stealth is not possible ships will probably attempt to minimise their signature over as broad range of the spectrum as possible, making it harder for weapons to lock onto them. Whilst detection cannot be avoided strategies such as misdirection and deception will be used to avoid identification and targeting. Their behaviour may try to mimic natural celestial bodies, so if they are seen they will be mistaken for objects such as wandering asteroids or friendly craft. In some science-fiction systems small ships use planetoids as heat sinks or hide in the space junk accumulated at the Lagranian points. Courses that pass behind celestial bodies or in front of strong EM sources like the sun may also be used where practical. An enemy will not see you if he does not bother to look in your direction. Spacecraft may detect enemy targets hours, days or even weeks distant. The short ranged energy and projectile weapons described previously in this blog cannot be used to engage such targets. Some form of long-range missile will be needed. One analogy for space combat describes it as resembling two nuclear submarines on opposite sides of the ocean duelling with ballistic missiles. The important caveat here is that a submarine’s primary defence is its ability to hide, which is not generally an option for spacecraft. 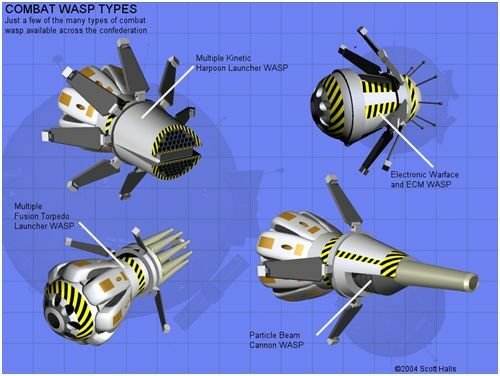 Below: Wasp Drones from Silent Phoenix. The space combat missile is likely to be a very sophisticated device. The distinction between a missile and a drone becomes blurred here and essentially the terms become interchangeable. In Transhuman Space the major weapon systems for spacecraft are the Autonomous Kill Vehicles (AKV). AKVs are unmanned spacecraft armed with laser and/or coilguns that use these weapons to engage enemy vessels at close range. AKVs will also ram targets if necessary. Rogue AKVs left over from a war years before pose a hazard to shipping, attacking vessels their outdated IFF does not recognize. These rogue AKVs are sophisticated enough to maintain and supply themselves by salvaging other spacecraft. TS AKVs vary from 30-300 tons mass, with 100 tons being typical. Where the number of AKVs carried by a larger craft is given in sourcebooks it is usually only three or four. Other entries do not specify the number carried but describe hanger bays of only 200-1,ooo tons capacity. Large TS spacecraft do not seem particularly well equipped for sustained combat. Obviously it is in a commander’s best interests to conserve and reuse his AKVs if possible. An AKV would need to retain at least half of its delta-V for a possible return trip. If it is decided to sacrifice the AKV the excess delta-V can be used to boost ramming speed. It seems logical that the AKVs be supplemented by lesser forms of long-range missile. I will call these “effectors”. The missiles that we are most familiar with are long aerodynamic shapes that generally fly towards their target until their fuel burns out. A typical effector drone is a barrel-shaped object that may be the size of a small car or bigger than a bus. Its shape makes it easier to store and handle within the warship. Conical and spherical variants are also known. In space combat an effector may take hours or even days to reach its target and may fly sophisticated courses, exploiting local conditions for sling-shot orbits or cover. Essentially the effector is a robot spacecraft on a one-way trip. The missile has several advantages over a manned craft. It will have a greater G tolerance so can use manoeuvres and tolerate accelerations that a manned craft cannot. Unlike the larger and more expensive AKVs it is not expected to be reused and a warship can carry a useful quantity. It also does not need to save fuel for the return trip and needs no life support resources so can be smaller and faster. Effectors do not generally have launchers or missile tubes. Drones are stored in any available unpressurized cargo hold or hanger. When it is time to fire a drone the cargo handling system simply carries one to the nearest hatch and releases it. The effector’s secondary propulsors push it away from the hull until it is far enough away to activate its main drive. As it accelerates away it will unfold like a flower to reveal sensor masts, radiator wings and tower-mounted attitude jets. Since a target may be hours or even days away this seemingly leisurely way of launching is not a significant delay. For larger effectors might be carried clamped to the outside of the hull, as some AKVs are carried. Once the effector has reached and located its target it must find some way to harm it. The simplest option is to simply crash into the target. "An object impacting at 3 km/sec delivers kinetic energy equal to its mass in TNT." When the velocity of an object reaches 3km/sec its kinetic energy becomes equal to the explosive energy of an equal mass of TNT. This is an exponential relationship in that at double this speed the object will have four times the energy, at triple nine times and so on. An object moving at 7 miles per second Earth escape velocity has about the energy of the explosion of fourteen times its mass in TNT so any impact will have a considerable effect. Kinetic energy continues to increase with increases in relative velocity. At relative speeds of over 190km/sec kinetic energy of two objects impacting begins to exceed that of a nuclear weapon of equivalent mass. The problem here is that of actually hitting the target given the speeds of the objects involved. Doubtless, however, if its other offensive systems fail an effector or AKV will attempt to crash into a target. Nuclear warheads are an obvious choice for a missile, although combatants in TS are wary of escalating to the use of nuclear weapons. The absence of atmosphere in space means that the blast effects of a nuclear weapon will be greatly reduced and the majority of the warhead’s energy will be converted into X-rays and gamma rays. A nuclear explosion in space has been described as being a momentarily brief, very bright flash without the fireball and billowing clouds so beloved by special effects departments. The damage range of a nuclear explosion in space is likely to only be about a kilometre in radius. Within this distance the damage will be considerable but getting a warhead to within a kilometre of a target moving at interplanetary velocities may be problematic. Since an explosion is a spherical event increasing the size of the warhead only offers limited returns. A warhead ten times more powerful only increases the effect area by about two and a half times. More practical may be to fire a number of smaller warheads in a pattern and hope one will get close enough. The lack of atmosphere will also greatly reduce the potency of conventional explosive warheads too. An explosive warhead that makes contact with a target or penetrates the hull will do considerable damage but proximity detonations will have only limited effects. The effector or AKV may have its own laser systems and other directed energy weapons that it can use to fire on the target from relatively close range. Effectors are well suited to the application of “bomb-pumped laser” systems. These are weapons that use the detonation of a nuclear or non-nuclear device to provide power for a brief, intense burst of directed energy such as an X-ray laser. Transhuman calls these “Teller mines” after the physicist Edward Teller. The X-ray Laser Munition Pack (XLMP) fired from an AKV or larger ship’s coilgun consist of a number of these devices with a total mass of 9.5 tons. A bomb-pumped laser device will destroy the firing platform but this is not a concern if the system is mounted on a disposable drone or missile. Included in this class of weapon is the shaped nuclear charge, a weapon that focuses the majority of its energy into a cone-shaped discharge of X-rays and plasma that is aimed at the target. An effector might carry a number of sub-munitions armed with bomb-pumped DEWs. During the final attack phase these would spread out and fire upon the target from several directions at once. Possibly the sub-munitions would use communication lasers or some other system to coordinate their attack between themselves. An interesting variant of the above is idea is to use Lithium Deuteride in a projectile and the energy of a high velocity impact used to compress it into an exothermic reaction. I like to think this might have been what the “Nuclear Pellet Launcher” mentioned in the TTA series of books was. Electromagnetic pulse weapons are another attack option, although for these to be useful they must have a wider effect area than a conventional nuclear weapon. An EMP weapon could be used to blind or disrupt a target’s systems so they would be are most useful if used to soften the target up for more destructive attack systems. One of the most cost-effective means of attacking spacecraft might be a Victorian idea, the shrapnel warhead. As stated above, at relative speeds exceeding 3km/sec a solid object has greater kinetic energy than the explosion of the equivalent weight of TNT. A shrapnel warhead may contain a small bursting charge and a mass of solid projectiles such as 2”/ 3lb cast iron balls. Cast iron balls seem the sort of thing that could easily be manufactured in a free-fall environment from an asteroid or scrap. One can easily envision a large spacecraft manufacturing its own. An exploding shrapnel warhead would create a cloud of shot over a large area, which may exceed the effect area of a nuclear weapon in volume. The effect area would also be more persistent. Warheads could be detonated so that the sub-projectiles either hit the target or the target flies into them. The small size and number of balls would make it difficult for a laser defence system to destroy them all. A laser system would have to vaporize each ball since they would still be a threat if molten or broken up. An interesting idea would be to pack the balls in sand or carbon dust to form a cloud that would interfere with laser fire. The shrapnel warhead itself would be rather robust. A nuclear explosion is a complicated event to initiate and relatively minor damage to the nuclear device might render it inert. The shrapnel warhead is mainly inert metal so would be more tolerant to damage from defensive fire. If the warhead is broken up or detonated the scattered shot would still pose a hazard to the defender. The shrapnel warhead and KKMP are not the only forms of kinetic weapon possible, of course. The effector may pack a number of larger short-range kinetic kill missiles, effectively the offensive equivalent of Kirklin mines. These might be designed so that if hit by a defensive laser they break into large fragments and/or release smaller “child” KE missiles so continue to be a hazard to the defender. Typically an AKV can only carry a single, ten-shot munition pack and launch it from a coilgun mounted to be forward firing. A railgun is a much lighter system and can be turret-mounted. The railgun gives the AKV the capability to engage multiple targets. Railguns are capable of accelerating a projectile at phenomenal speeds. A railgun round that penetrates a ship’s hull is likely to perforate a number of internal compartments as well, possibly punching out the other side of the vessel. Smaller targets hit by a railgun will be shattered, pulverised or even vaporized. A hit from a railgun can be devastating but in a vacuum a miss of a few inches will have negligible effect on the target. A railgun round may be accelerated at 20,000 to 60,000g and such forces pose considerable problems in creating guidance systems suitable for a railgun rounds. Whether these challenges will be solved by the TS-era, or will actually need to be addressed remains to be seen. It can be assumed the majority of railguns use unguided rounds. Acceleration forces also make it problematic to use unstable compounds such as explosives in railgun rounds. When a projectile’s velocity exceeds 3km/s the need for an explosive component is debatable. Railguns generally use solid shot or “slugs”, either of hardened steel or steel with a tungsten or depleted uranium core. A 3” calibre railgun slug or shot for a 5” (127mm) railgun masses about 33lb. Each round is acutely pointed but this point is covered by a cap of softer material (above) that reduces the chance of a round glancing off armour. AKV railguns use the same ammunition as other railguns but tend to be simpler than other models since they are likely to only be used for a short duration. Waste heat production and excessive wear are less of consideration on such models. A railgun can be refurbished if the AKV survives its mission. Instead of the 5” railgun some AKVs and smaller vessels mount a 3” railgun that fires a 57mm projectile of 15lb mass. The 3” railgun permits more rounds to be carried within a given volume. Below is a tentative proposal for such railguns, based on the rules in Spaceships (4e). Railguns are typically turret mounted. d-Damage is multiplied by relative velocity of combatants and subject to an armour modifier of (2). Minimum relative velocity for these railguns is 3 mps. Rof value varies with turn length and weapon type. See p.58 of Spaceships (4e) for Rof. The enemy may be well aware that an effector or AKV is on its way and have several days to prepare. He may launch an effector or AKV of his own to destroy the incoming threat. This suggests that the attacking vessel may have their own defensive systems and the defensive vessel counters to these. The effectors and AKVs will doubtless use ablative armour, evasion and other defensive methods to increase its chances of reaching the target.